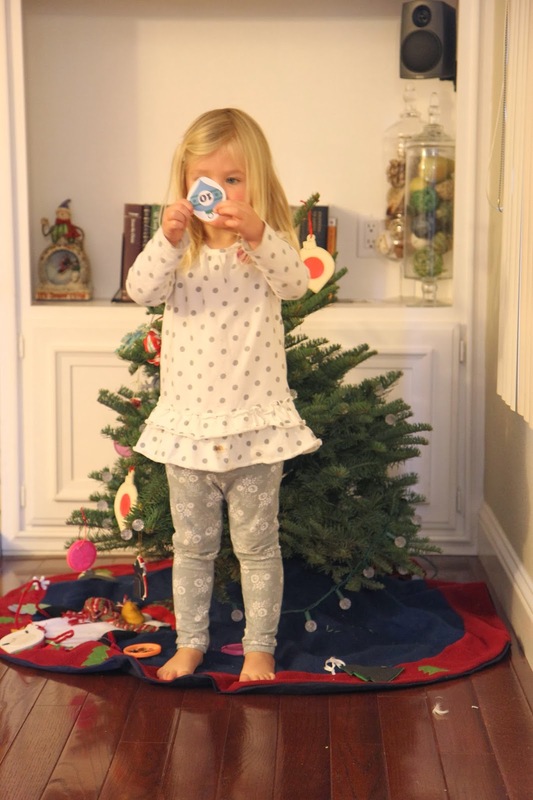 Don't forget to sign up for our A Very Toddler Christmas Newsletter! You'll get a toddler Christmas activity emailed right to your inbox every day of the month through Dec 23rd. Read more about it here. Everyone at our house was a bit crazy and grumpy yesterday. I knew I needed to get us actively doing something that required us to work together and get moving. 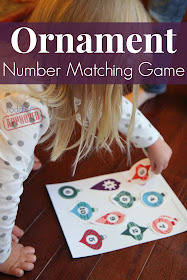 We decided to play an ornament number matching game. The game involved hiding numbers, hunting for them, and then matching the numbers. The second I said "we are going on a hunt" both of my older kids cheered up and were ready to play. The first thing I did was print out two copies of my FREE ornament number match printable (page 1 was for my 3-year-old, page 2 was customizable for my 5-year-old). Then I quickly cut around one set of numbered ornaments. It look about 2 minutes... which is about the amount of time I have to prep for an activity these days. Wahoo! After that I showed my daughter how the cut up ornaments matched with the ones on the sheet. We did a practice match or two and then my son and I collected up the cut out ornaments and hid them all over our family room. 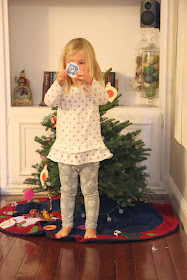 After all the cut up paper ornaments were hidden, my 3-year-old ran around trying to find all ten numbered ornaments (with occasional hints from her brother). As she found each one she put it on top of her numbered ornament sheet. She had to show me each ornament when she found it and liked trying to read the number too. She got them right about 75% of the time which was surprising to me! I didn't know she knew all those number names yet. It is amazing how much learning can happen when you create fun and playful learning opportunities. Once my daughter was done, we hid my son's addition problem ornaments. After he found them he had to do the addition problem before he could go match the ornament. He loved it and I didn't make it nearly hard enough. You can use the blank ornament page to adapt this activity for whatever you want... color matching, shapes, alphabet letter matching, etc. Do your kids every get grumpy or stir-crazy when they are indoors? Make sure to check out our Christmas music workout for kids that we shared yesterday. In addition to doing simple Christmas learning activities like this one, we are also Keeping Christmas Cozy and are doing some fun advent activities with my older and younger kids. You can buy your own printable set for a recently reduced price of $3.99. Check out my Making the Holidays Cozy post for more details. Love this idea! Printing it out now. Need some stuff my 4 year old can do while I'm sewing Christmas projects :) And then I love how I can change it up for her 7 year old brother. I think I'll put dots on the ornaments and she'll have to count those and then match those to the numbered ornamets. Thanks for sharing! This is great! Just printed these off for my triplets! Perfect timing! !